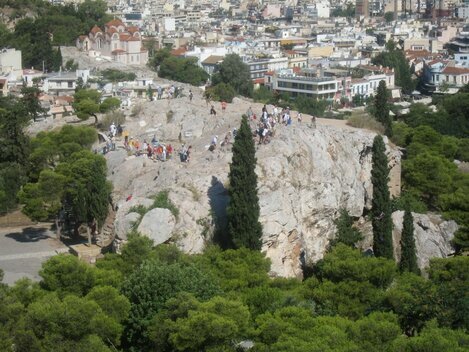 ​Also referred to as the Areopagus, the composite form of the Greek name Areios Pagos, translated "Ares Rock", it is located north-west of the Acropolis hill, across from the entrance to the Acropolis. ​Its sixteen ancient marble steps can be slippery, especially in the rain, so the visitor should wear anti-slippery shoes! They lead the visitor to a rectangular terrace. ​Above it there is a second terrace with several cavities and notches still visible. A large stone, an isolated cube, on the East, probably served as a seat, either to the accused or to the accuser of the court. Another reason to climb the hill is for the view. To the north you can see most of Athens, to the west lies the Aegean sea and the port of Piraeus, while back to the east is a clear view of the Propylaea on the Acropolis. 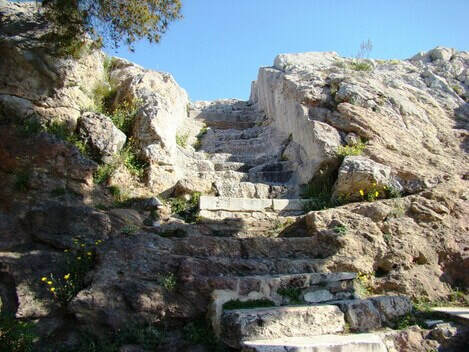 The steps to Areos Pagos. The origin of its name is not clear. In Ancient Greek, pagos means "big piece of rock". One myth tells how the Amazons, who were Thesseus' enemies, camped on the hill and dedicated it to Ares, the god of war. Another says that Ares was supposed to have been tried there by the other gods for the murder of Poseidon's son Alittothios, or from the Erinyes (Furies), as on its foot there was a sanctuary dedicated to the Erinyes, where those accused of murder used to find shelter so as not to face the consequences of their actions. Later, the Romans referred to the bare rocky hill as "Mars Hill", after Mars, the Roman equivalent to Ares. 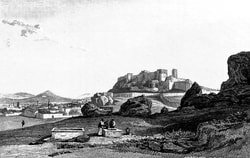 In pre-classical times (before the 5th c. BC), the Areopagus was the council of elders of the city, similar to the Roman Senate. Like the Senate, its membership was restricted to those who had held high public office, in this case that of Archon. 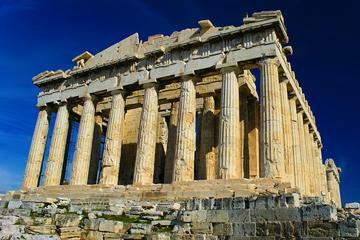 ​In 594 BC, the Areos Pagos agreed to hand over its functions to Solon for reform. Solon instituted democratic reforms, reconstituted its membership and returned control to the organization. Under democracy, it became primarily the court with jurisdiction over cases of homicide and certain other serious crimes. After an Athenian had served as one of the nine archons, his conduct in office was investigated, and if he passed that investigation he became a member of the Areos Pagos. In classical times, it functioned as the high Court of Appeal for criminal and civil cases. Tenure was for life. In 462 BC, Ephialtes put through reforms which deprived the Areos Pagos of almost all its functions except that of a murder tribunal in favor of the court of Heliaia. ​In The Eumenides of Aeschylus (458 BC), the Areos Pagos is the site of the trial of Orestes for killing his mother (Clytemnestra) and her lover (Aegisthus). Phryne, the hetaera from 4th c. BC famed for her beauty, appeared before Areos Pagos accused of profaning the Eleusinian mysteries. One story has her letting her cloak drop, so impressing the judges with her almost divine form that she was summarily acquitted. ​In an unusual development, the Areopagus acquired a new function in the 4th century BC, investigating corruption, although conviction powers remained with the Ecclessia. 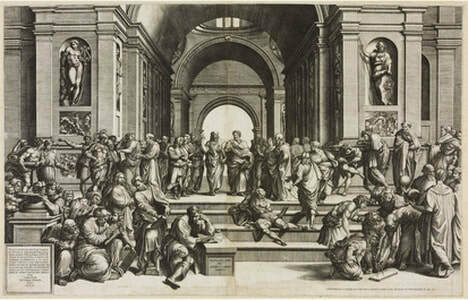 St. Paul the Apostle preaching to the Athenians. Areos Pagos, like most city-state institutions of ancient Athens, continued to function in Roman times, and it was from this location, drawing from the potential significance of the Athenian altar to the Unknown God, that St. Paul the Apostle is said to have preached his famous speech, "Now what you worship as something unknown I am going to proclaim to you. The God who made the world and everything in it is the Lord of heaven and earth and does not live in temples built by hands." (Acts 17:24) Near the base of the stairs is a bronze plaque with the Greek text of St. Paul's sermon. Today, the term "Areos Pagos" also refers to the judicial body that subsequently formed the higher court of modern Greece. of this world-heritage site and its breathtaking monuments.